Happy New Year! 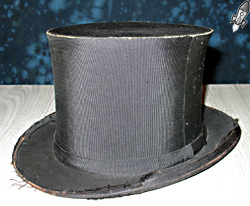 One of the symbols of New Year's Eve is the fancy dress top hat (the collapsable kind pictured here is called an Opera Hat). 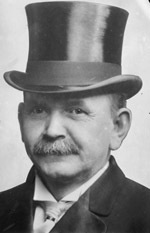 Men's formal hats have mostly disappeared, but the top hat still sticks around as a symbol of wealth or formality. Or.. um... stage magic, but that's another story. I've since inherited a very fine top hat from a relative who was a statesman, but unless you are being inaugurated president (Nixon was the last to be sworn in morning dress and a top hat) or are Alice Cooper, you'll probably have little use for one. While my beat up top hat and I hat are out celebrating the New Year tonight, I'll be reflecting on the 2006. I can say sincerely that one of the best experiences for me this past year has been writing for Retro Thing. It's nearly a year since James invited me to collaborate on this blog, and its been tremendous fun all the way. I'm proud of our many quirky posts (a few have even been cited as sources in the Wikipedia! ), and that so many of you have taken the time to write in say that you enjoy what we're doing. Our readership has grown steadily over the last year and we hope to keep growing throughout the next year. James and I have been planning a number of things behind-the-scenes for 2007 (more free giveaways for one thing! ), so this should be a fun year for us all. Of course the best way to help make this blog what you want it to be is to keep writing in! We love reading comments, and it's the most direct way to let us know what you keep coming back for. We also want to tip our hats to our sponsors throughout the last year. Their support keeps Retro Thing alive - our thanks to them all. We do it for you - so keep coming back, mention us to your friends, and most of all pop on your top hat and have a fun and healthy 2007! Thanks for a great year everybody! A while back we wrote about some girlie barware - drinking glasses with a risque surprise when you spun them around. In the interest of equal time, we thought we'd feature some glasses with all the surprises up front. These glasses are souvenirs from the Sugar Shack in Lake Geneva, Wisconsin. The Sugar Shack departed from the accepted meaning of "gentleman's club", using the term "gentleman" to refer to to the featured fellows performing on stage for the female clientele. 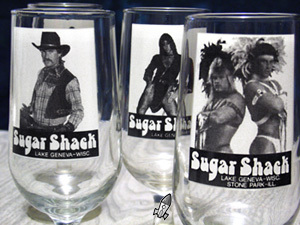 These souvenir glasses date to somewhere in the 70's or 80's, and are rather giant - the ladies hanging out at the Shack could clearly put it away. I got these glasses years ago at the thrift for pennies a piece, and I still see them for sale from time to time. The Sugar Shack must have sold a lot of these back in the day for them to still litter Chicago thrift stores 20 years later. 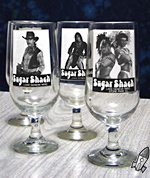 You can't take home the dancers, but at least you can have a souvenir glass with a grainy photo of the brokeback cowboy, leatherguy, or Sigfried & Roy wannabes that gave you their all on your special night. I should have probably posted this a few days ago, but it does include good wishes for the New Year as well, so I'm only half late - okay? If we wanted to, Retro Thing could easily become Retro Tobacco Thing as there are just SO many kitschy novelties associated with smoking. At the risk of going down that path, here's another item to encourage you to both smoke and smile. Not only do you have a cute little Santa guy clicking his heels and plucking at his lute (or is it a bowlback lefety Ovation? ), there are some holiday wishes spelled out in a jaunty font down below. What you likely can't make out in the photo is the teeny type that tells us that the ashtray is from smoking well-wishers "Pauline and Mel Williams". 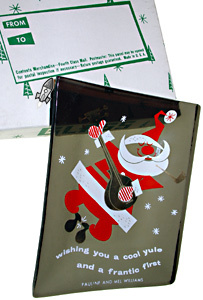 In any case - just like the ashtray says - we at Retro Thing hope that you had a cool yule and also wish you a frantic first! We really do live in the future. Over the last 10-20 years, it’s become perfectly normal to carry around a TV set in your pocket. LCD imaging and clever CRT designs have made it possible to create truly mini TV’s since about the 80's. 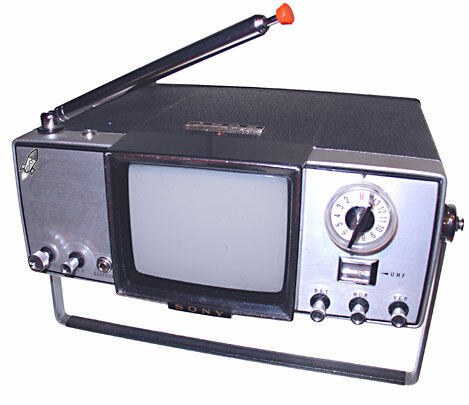 Now imagine the stir this little black and white transistorized television made when it was introduced in 1965 - the literature of the day called it a "Walkie Watchie" - glad that name didn't stick! The Sony TV400V is remarkably small; about the size of three soda cans in a row. 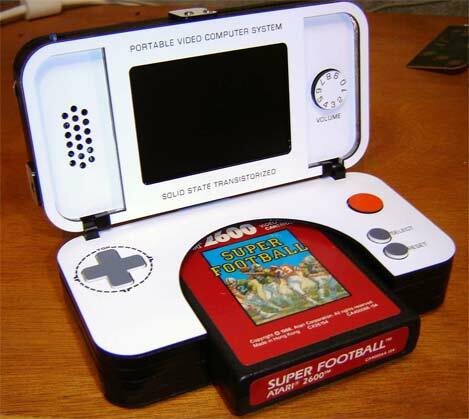 Everything about it is miniaturized; the 3.5" screen, the speaker, even the buttons and knobs. Futuristic function clad in a lunchbox-handled case with spiffy Tricorder styling. Surprisingly, this TV could be even smaller since about a quarter of its bulk is taken up by the rechargeable battery pack. Yep - you could take TV on the road with you back in 1965. I wish that I could tell you how good the picture is, but the AC cord receptacle isn't like anything that I’ve ever seen. It would sure be fun to catch some reruns on MeTV (Chicago UHF station that shows classic TV). If I can find some way to get power into the 40 year old batteries, I’m going to take this TV on the bus with me. Hooked up to unmistakably modern white earbuds, imagine the heads turning as I chortle while watching Sergeant Bilko. Then again, maybe I don’t need to encourage more people into thinking that I'm some strange indigent. 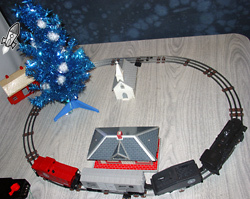 One of the classic images of Christmas time is a toy train running around the base of the tree. Scale model trains would choke on the bits of carpeting and pine needles under the boughs, so the best choo-choo for the task is a classic Lionel train. 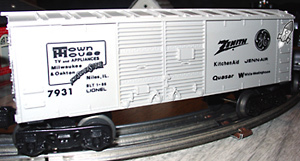 Some "O27 scale" trains sacrifice detail for durability, striking a balance between toy and model trains. 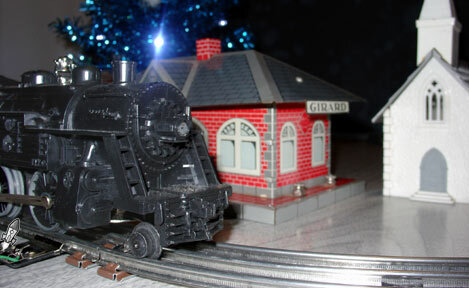 Countless lifelong model train buffs got their start with Lionel train sets under their tree. This set has a special Chicago link. Town House TV & Appliances ("Milwaukee & Oakton!") was a frequent advertiser on local TV & Radio. Their jingle became part of Chicago's soundscape, and every Christmas since the 70's they gave away these train sets. It's a cute starter set, featuring a boxcar lettered for the store and the many brands that they sold. This super sturdy Lionel train set is around 30 years old, and yet it powered up right away running smooth as silk - amazing! Town House is gone now, another fallen flag to the might of big box retailers, but their memory lives on. When I mentioned to friends that I'd found this set at the thrift for $2, they each sang Town House's jingle through envious grins. I guess that holiday traditions come in many different forms. North American Aerospace Defense Command (NORAD) keeps their eyes on the skies to warn against bad guys for the United States and Canada. Since the close of the cold war, they perhaps have less to do in their mysterious mountain complex. This time of year they turn their highly secret resources toward a more benevolent, yet equally mysterious airborn unknown. 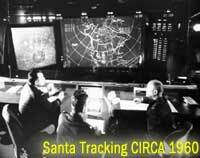 The men and women over at NORAD turn their radar dishes, UHF antennas, and kaleidoscopes toward the heavens to track Santa during his worldwide journey on Christmas Eve. If your children need extra persuasion that Santa is near, click over to noradsanta.org throughout the day and see where Santa is on his trip throughout the world. I'd love to see for myself when Santa is "escorted into Canadian airspace by jet fighters", but alas my mother doesn't have "the interwebs". Can someone please call me when Claus has entered Chicago (Berwyn, really...) airspace? Free download of "Santa Claus Conquers the Martians"
I wish Ben Heckendorn was a senior member of the R&D division at a large electronics company. 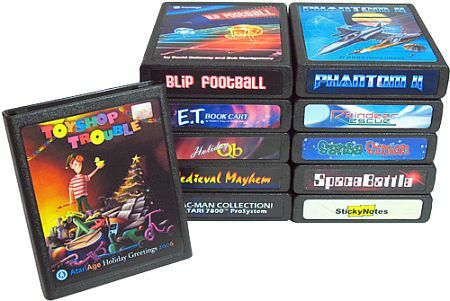 It really causes me pain every time he produces yet another clever handheld vintage game console that can't be bought at any price. This is his latest one-off - a stunningly compact ode to the Atari VCS. As far as I'm concerned, the next best thing to owning one of Ben's masterpieces is the Linux-based Gamepark GP2X. It's a modern gaming platform with an old soul, thanks to enthusiastic support from hobbyists around the world. In addition to hundreds of original titles, the Korean-made system runs MAME GP2X, which emulates more than 1100 classic titles. Until recently, the unit was only available through offshore distributors. Because of its growing popularity, the system is now available in the USA directly from GP2X Store in Yorba Linda, California. One thing I really appreciate is that they offer spare parts at reasonable prices - so you don't have to pay a fortune to replace a scratched screen panel or lost joystick cap. 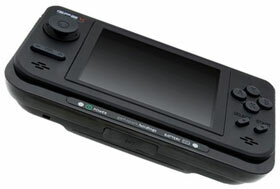 We're also really pleased to mention that GP2X Store is sponsoring Retro Thing this month. Thanks, guys! It has been over a decade since I last purchased a 7-inch record and the idea seems almost quaint in our modern iTunes world. 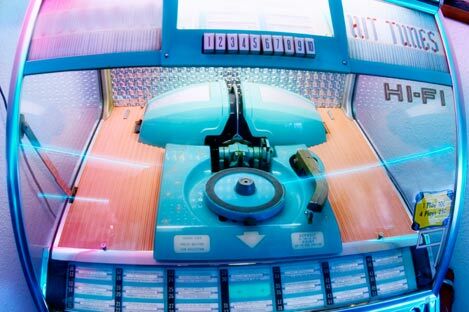 But the old 45 RPM single was once a staple of the industry; 89 million were sold at their peak in 1979. They gradually lost favor as our tastes shifted to cassette and CD formats. Believe it or not, a mere 178,831 7-inch records were sold in Britain in 2001. 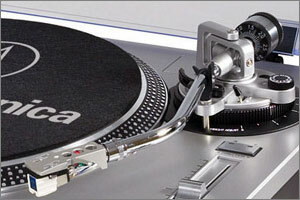 Things are looking up for vinyl, thanks to renewed interest in analog technology. The British Phonographic Industry reported sales of 1.87 million units in 2005 -- the highest volume in a decade. Billboard reports that releasing a 7-inch single is now akin to a badge of honor: Dougie Souness, founder of Glasgow, Scotland-based artist management firm No Half Measures, says a limited edition pressing of 7-inch singles strengthens its appeal. "There's been a backlash, dare I say, against the digital world. People are now thinking that little bit of plastic with a hole in the middle is actually a pretty cool thing to own." We've written about miniaturization before. Back in the day it was a real show of your tech prowess to make a smaller radio/camera/television than the last. Today everything is miniaturized, and it's easy to get kind of blasé about small devices like music players, so it must take something extra special to get music fans to sit up and take notice. The MobiBlu Cube2 is a full-featured MP3 player housed in a 70's geometric/mod inspired cube, clocking in at less than one cubic inch. There are other players with about the same displacement, but putting it all in a perfect cube is an unexpected touch of elegance. More importantly the MobiBlu sounds good, is easy to use, the controls are a good size, and the screen is terrific (yes iPod Shuffle people, an MP3 player at this size and price point can have a screen). Even though it's diminutive, the MobiBlu manages to be packed with features. It plays MP3, WMV, and the much vaunted OGG (yay!). It's got podcast subscription software right in the unit, a built in mic, radio - pretty much everything you'd expect from a full featured MP3 player. Unbelievably the color screen can even play video. Yes Mr. Farnsworth, you're looking at a 1 inch cube with a video screen. Folks bandy about the term "iPod killer" all the time, but the MobiBlu is the first MP3 player I've used that I think has a chance to topple Apple's baby. "While wasting my time looking through vintage aircraft information (a new habit of mine for which your site is entirely to blame) I came across some information on the Yakovlev Yak-52, a Soviet trainer from the 1970s. The nifty thing about this particular piece of aerospace engineering is that it is still available for sale, nearly unchanged from the original (it is produced out of Romania by Aerostar). The plane has apparently become so popular within the export market, that a 'westernized' variant is now in production, very intelligently tagged the Yak-52W. While it may be a new aircraft, retro-features include a radial 9-cylinder engine, a wood and glass-fibre prop, an optional tail-dragger configuration, and styling typical of the Yakovlev name. Aerobatic features and equipment have also been included.There is a used one in the US that is asking $95,000, so I would imagine that this plane new falls between 'small air force budget' and 'if you have to ask, you're not worthy'." I did a bit of digging, and it appears that the Yak-52W retails for a more-or-less reasonable €155,000. That's not bad for an aerobatic vehicle with a 400 HP radial power plant and the feel of a classic warbird. The taildragger variant is known as the Yak-52TW. 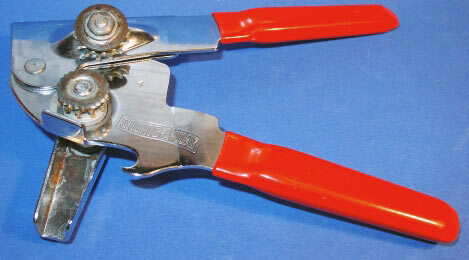 Much to my hungry heart's despair, I misplaced my can opener last week. It reappeared shortly before I resorted to bashing a tin of beans with hammer. It was enough to force me to realize that I've been taking my little tin-opening friend for granted. It's stood beside me through thick and thin and never once complained about noxious substances or my strange addiction to Heinz Baked Beans. My faithful companion is a secondhand "Made in the USA" Swing-A-Way that's been with me for at least fifteen years. An updated version of the same device is still on the market, and it hearkens back to the good old days when things were constructed out of solid steel and intended to last a lifetime. The design definitely puts function over form. I dimly realized my Swing-A-Way was a worthy Retro product when I researched the company and discovered they were founded in 1938 (the spiky bottle opener attachment should have been a giveaway, too). Swing-A-Way participated in the Space Race, too; one of these incredibly high-tech devices was used to stave off starvation on NASA's ill-fated Skylab missions in the 1970s. Alas, my nippy little friend has seen better days and refused to pose for a photo. I called Bohus in a panic and asked him to venture into his kitchen in search of his can opener. Luckily, he is one of the millions of people on this continent with the good taste to own one of these magnificent beasts. Available for under ten bucks at a kitchen store near you. Unless you live in Iceland. ok not really, but tell him I think he's the coolest 4.5 year old EVER! Bohus and I have been absolutely astonished by your response to our work in 2006. Your comments and story ideas have been exceptional (there are a few great user submissions coming up next week) and we're serving around 200,000 pages of Retro goodness each month. If you like what you see, please support the site by purchasing a copy of our book (we'll include free USPS Priority Post shipping until the end of the month), browsing our online shop, or visiting our sponsors: Messiah Entertainment, GP2Xstore and Art Thang. These guys quite literally keep the lights on and the servers running. Thank you all.